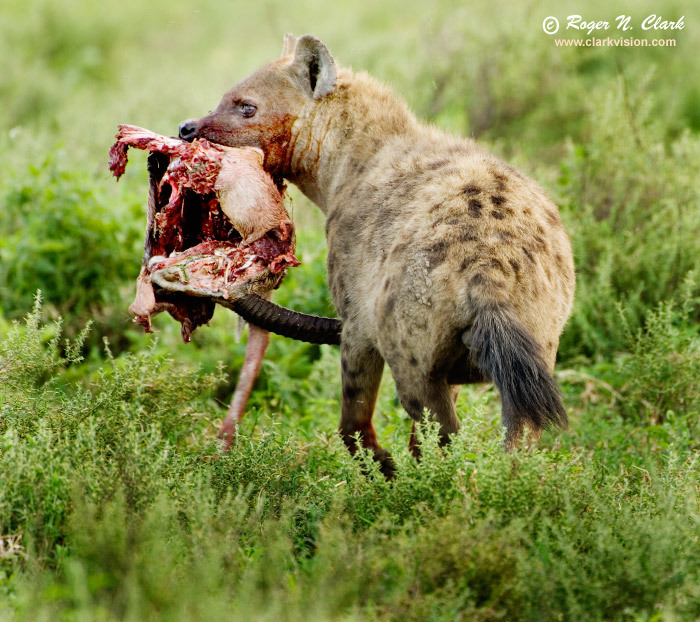 On the Serengeti in Tanzania, Africa, this hyena stole a gazelle carcas from a cheetah. The cheetah did not challenge the hyena (several of them). The cheetah must kill fast, eat and move on rather than risk injury in a fight with a hyena. Technical: Canon 1D Mark II 8-megapixel camera, Canon 500 mm f/4 L IS lens. Exposure: 1/100 second at ISO 200, f/4, +0.3 stop. Full height image, crop horizontal.